X-Small (2T-4T) - $48.99 Only 1 left! Small (4-6) - $48.99 Medium (8-10) - $48.99 Only 3 left! Being the pharaoh may seem like fun, but it's not all it's cracked up to be... who are we kidding, it sounds like a real blast from the past! Your little princess can have some ancient fun dressing up in this Kids Cleopatra Costume, and becoming one of the most famous rulers in history! Everyone has heard of Cleopatra! Even if someone has never read a history book in their life, they know that Cleopatra was one of Ancient Egypt's most famous pharaohs, and is well known for her wisdom, charm, and beauty. Like her Egyptian subjects, she dressed in clothing fit for life in a desert climate, except her outfits were much more ornate and glamorous. The leader of an ancient empire can't be caught in her palace wearing a boring outfit, after all. And why would anyone want to take a trip down the warm Nile River under the hot sun in stuffy robes? A beautiful, light and billowy gown sounds like a much more comfortable and royal choice for such an occasion! 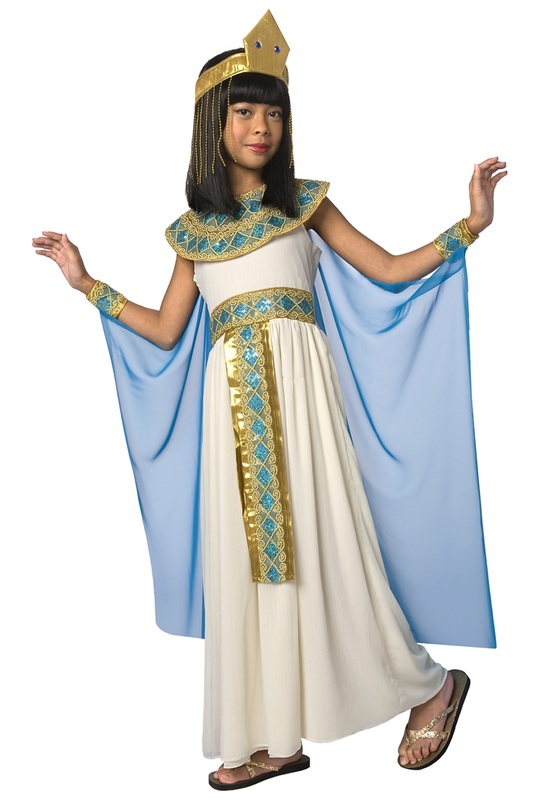 Your kid will look so elegant in this Ancient Egyptian-inspired costume dress, which captures the look that Cleopatra may have worn as she carried out her daily duties as pharaoh. The full length gown and sheer blue cape are simple yet stylish, and the light colors look especially regal when combined with the included gold colored belt, collar, and dazzling headpiece. Add a pair of ancient-style slippers to complete this historic look!